Recreate your AIESEC moments this 8 Nov 2013 (Fri) at Concorde Hotel Kuala Lumpur, in conjunction with the 45th Anniversary Celebrations of AIESEC in Malaysia. Reconnect with fellow AIESEC alumni, get to know current AIESEC members, and join the excitement as the board members of 2012/2013 receive the awards to celebrate a year of achievements and job well done. Make your payment to AIESEC Alumni Malaysia Maybank Account by 1 Nov 2013 (Fri), and go here to validate your registration after the payment. Have questions or encountered problems? Make your payment to your appointed representative upon your arrival in Malaysia. Travel by Monorail and disembark at Bukit Nanas station. Hotel is within 150m distance from the station (approximately 10min of walk). 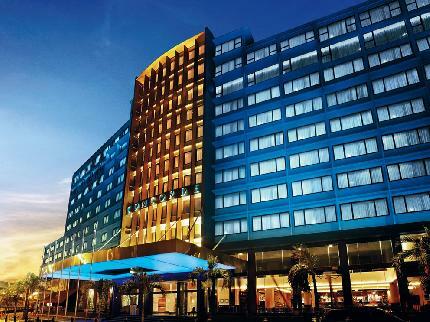 Concorde Hotel is located at Jalan Sultan Ismail, the central of Kuala Lumpur and within one-hour's distance from Kuala Lumpur International Airport (KLIA). Depart early to allow avoid Friday after-hour traffic in the city. Get a cab and let it bring you to Concorde Hotel Kuala Lumpur from the airport, or travel to KL Sentral station by KLIA Express train service and hop on to the KL Monorail train from there and disembark at Bukit Nanas station. No celebration is fun without the crowd. Get your best buddies and fellow AIESECers to join and register as a party of 5 persons or more for the group discount. Register your details and that of your fellow party members. Remember to include your email address and phone number so that we may contact you for important updates. Make your payment via online banking to the Maybank account of AIESEC Alumni Malaysia, and note the reference number of the transaction. After you've made the payment, go here to validate your registration and complete the process.